When it comes to sports books, I enjoy reading ones about baseball. The true stories about individuals in the game and the game itself. I think Buck Martinez is one of the best announcers in the game today. He is very insightful and knowledgeable about the game of baseball that when I saw he had written a book about it, Change Up, I had to give it a read. Buck Martinez has been in and around professional baseball for nearly fifty years as a player, manager and broadcaster. Currently the play-by-play announcer for the Toronto Blue Jays, Martinez has witnessed enormous change in the game he loves, as it has morphed from a grassroots pastime to big business. Not all of the change has been for the better, and today’s fans struggle to connect to their on-the-field heroes as loyalty to club and player wavers and free agency constantly changes the face of every team’s roster. 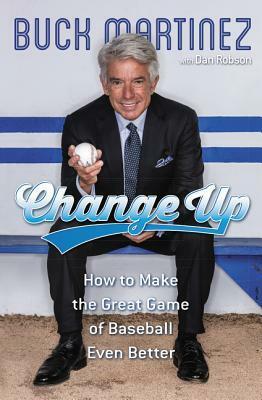 In Change Up, Martinez offers his unique insights into how Major League Baseball might reconnect with its fanbase, how the clubs might train and prepare their players for their time in “The Show,” and how players might approach the sport in a time of sagging fan interest. Martinez isn’t shy with his opinions, whether they be on pitch count, how to develop players through the minor-league system, and even if there should be a minor-league system at all. Always entertaining, ever insightful, Martinez shares brilliant insights and inside pitches about summer’s favourite game. In this book, Martinez is very honest about his own skills and abilities, admitting to mistakes he has made in the past. There are some very humorous moments in the book which are needed in a study of the game such as this. My favourite stories was how he made the transition from player to broadcaster. I won't spoil it for you but it was so good that I came into the living room and read the part to Teena. I found many surprises, as did he, in how players are managed in these modern times. It seems that team managers have to answer to player agents as much as they have to manage the players, even regarding things like changing the batting order. Change Up is an eye opener for any baseball fan. It was a good off season read and really a good read for any time of the year.